You would have watched Ben Hur where a creative story revolves around the life time of Jesus. You would have watched Titanic where a beautiful love story is written on the real story of Titanic. Have you ever watched a magnificent, spectacular story being crushed, stamped and buried mercilessly by a talented director? 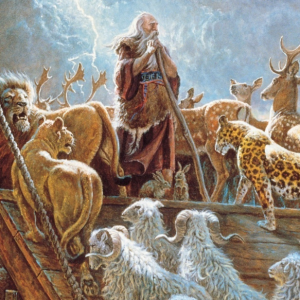 Darren Aronofsky just did in “Noah”. When you read the actual story in the Bible, it in itself is spectacular. Splendid what not. You don’t have to put in your creative brain to see how you can show off your intelligence and moral thinking. The story itself speaks volumes. Sometimes, its better you make a dish as it has to be done and not try your skills into it. The end result would not even be edible if you did so. Noah to any Christian would just leave them in tears as they see a beautiful story being told the worst way you can. Give the movie to the devil and I bet he can recite it better. Let me stop my heart breaks here and try to explain why its so worse. You got money, you got the best actors and you definitely have brains: Common, you cannot be excused even if these three weren’t there. When you have actors like Russell Crowe & Emma Watson and a company like Paramount Pictures backing it and after making movies like Black Swan, sure you could have done better. “It’s the least Biblical movie ever made”? Yes? Then why name it Noah? Then why show it to a group of Christians? Then why ask Pope to see it? Then why show the trailer with only the Biblical bits? Why don’t you have poster with the non-biblical bits? Nepliums build the Ark: Common is this how you show your creativity? Whats all that berries and Methuselah? Common, yes Methuselah did live till the year of fload but atleast because he was the oldest person mentioned in the Bible you could have made his part little more interesting than searching for berries. Great great sin: They were non-vegetarians. Darren, I pitty you. Please go back and read the Bible. Tubal-Cain: Yes he is a weapon maker but why make him fight Noah and break into the ark? By thinking breaking into the ark is spicing up the story, you infact broke the story itself. Humanity should die because they destroyed nature: If God ever sees the movie, he will certainly think of murdering us but then that wasn’t the reason why God wanted to bring the flood. There was a much better reason for it. Serpant Skin: eeew, whats that? Noah’s sons search for wives: What? They already had wives. Why make them search? You wanted to give some more acting for Emma? You could have asked a Sunday school kid. Maybe the kid would have had some brilliant ideas. Opening ark door as an when he pleases: Please please go back to Sunday school.. I have stopped in 10 points because am trying to compare the Bible with a story no way related to Bible but has been given a Biblical name. For those who have never read the story please read Genesis 6. If you don’t want to read the Bible and understand why I am so upset, then let me try to give you an example. Plot: Michael Jackson is of French decent and likes to sing and dance but not too much into it. MJ goes to church and makes gospel dance albums. However, he drinks often too and eats meat all the time. His dance moves are taught by The Transformers. His first daughter has twins whom he tries to kill. The other two children search for their better halfs. Jackson dies at 50. Well, I guess you now sort of get it why Christians hate the movie. Its not because its “least biblical” but because you just murdered the art of creative story telling.